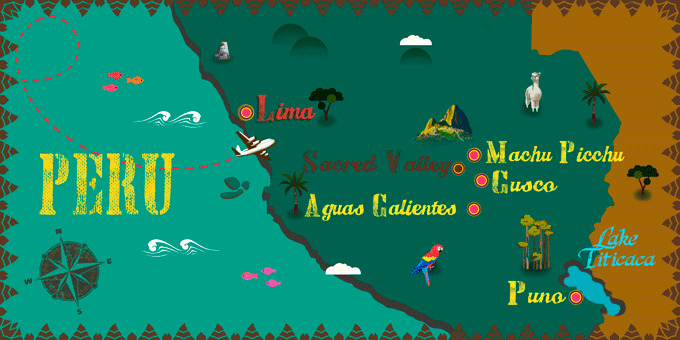 "Peru showed us many unique sides of life and an abundance of culture. Everyone we met was very friendly and we enjoyed learning about life here." When my husband and I were younger, we used to holiday a lot in Europe, often opting for beach holidays on the Greek Islands, but since getting older we’ve become more adventurous! In recent years we’ve really taken to visiting far-flung places. We’ve been to South Africa, Botswana and Zimbabwe, taken a helicopter ride over Angkor Wat in Cambodia and enjoyed safaris in Kenya! South America, and in particular Peru, was on our long list of places to visit so we were excited to book up and tick it off our list! 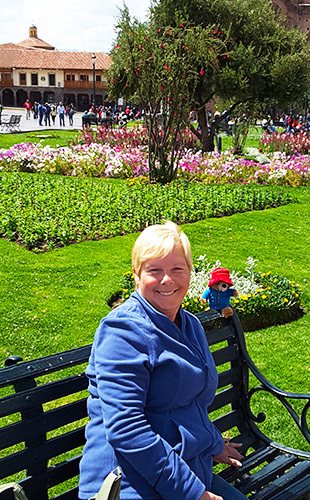 Of course, my little Paddington Bear travel buddy, who follows us on our travels, was packed in the suitcase and would accompany us to Peru! We were most looking forward to seeing Machu Picchu, the iconic UNESCO World Heritage Site, having seen and heard so much about it. The idea of travelling to a destination at altitude, like Peru, was a little daunting due to my fear of heights, but I’m always enthusiastic to do those things that scare me, as it’s always worth it in the end! 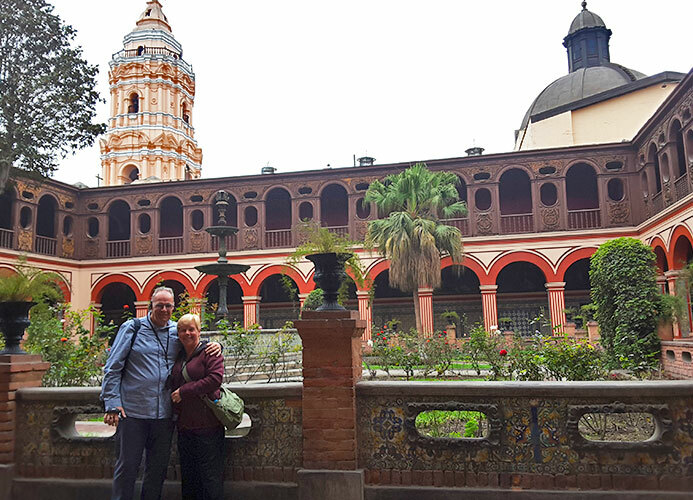 After a long journey, and a connecting flight in Bogota, we arrived in Lima and spent the first few days getting to know the city, walking down to the harbour and taking a city tour. We loved watching the paragliders jumping from the cliffs and the city itself was really nice, with lots of places to eat and drink. We were met by a guide on the first day who gave us all of the itineraries, tickets and information in a little box so we had a clear idea of what to expect on the trip and could relax and enjoy, knowing all the organisation was taken care of. We also got to meet the group. There was 12 of us, made up of a good mix of ages. The group size was perfect as it wasn’t too many people to keep track of for the guides, and we never felt as if we were being herded around. The guides themselves were always on time, impressively knowledgeable and just couldn’t do enough for you. By the time we had got to know Lima, we were ready to set off for Puno, home to Lake Titicaca and set at an amazing 3,810 metres above sea level! 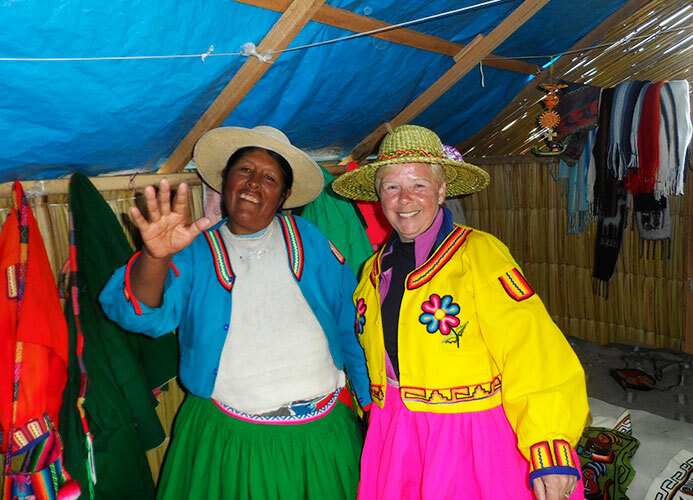 The views were phenomenal and the excursion to the Uros and Taquile islands was one of the highlights of the trip. The day of the excursion was lovely and sunny and we loved the boat ride on the lake. On Uros Island, we were introduced to the locals who live there who kindly gave us a demonstration of how they build their amazing floating islands. After this, we went to Taquile Island for a traditional lunch with the locals which was a lovely insight into the daily lives of these unique people. Next stop was Cusco, the old Inca capital of Peru, and we were enchanted by its main square or ‘Plaza’, where we saw plenty of lively locals, spending the nights chattering in cafes and bars. There was also an exhibition of local art held in the square which was lovely to see. The traditionally dressed Peruvians, clad in brightly coloured clothing, and the women in their iconic bowler hats could be seen selling their wares throughout the town. We also enjoyed shopping in the markets and soaking up the atmosphere. The hotel here, like all the rest, was perfectly situated for getting out at night and having a wander. Aboard the Expedition train, we headed to Machu Picchu, stopping first in Aguas Calientes, a quaint mountain town known as the gateway to Machu Picchu. We loved it here and would have happily stayed another night. There was a lot of nature in the surrounding areas and my husband even managed to catch sight of a hummingbird caught it on video! Machu Picchu itself was, of course, amazing, as expected. We enjoyed a tour here and the weather in the earlier part of the day was very clear and good for photos. Later on, it clouded over and then rained really heavily, which although unfortunate, showed us the ancient Inca site in two different lights. The weather was very changeable in Peru, so I would advise future travellers to come prepared as one minute the sun is beaming down and the next there might be rain so we were sure to keep our ponchos at hand! You can’t talk about a trip to Peru without mentioning the altitude. We had read all about the do’s and don’ts of dealing with altitude so we drank lots of the Coca Tea, as recommended by locals, starting from when we landed in Lima. It really seemed to help and other than a mild headache on our first day in Cusco we were fine! I tend to stick to what I know when it comes to food abroad, but I was surprised to see that one of the most popular dishes on offer throughout Peru guinea pig meat. I gave this a miss, especially since I used to have one as a pet! My husband was quite keen to try it though. Peru showed us many unique sides of life and an abundance of culture. Everyone we met was very friendly and we enjoyed learning about life here. I loved how the locals spent their evenings sitting outside in the plazas, altogether as families and as communities. At home, we’re all so used to sitting in front of the television in the evenings and have lost that sense of community that we once had. It reminded me of life in the UK when I was young. The way the people lived on the islands of Lake Titicaca was also very eye-opening. Each of the separate communities takes turns looking after the crops and growing the produce, rotating the work-load every four years. They live a simple life but their sense of community and their willingness to share the fruits of their labour was humbling. In the future, I would love to discover other parts of South America and continue travelling to other exotic destinations. I seem to be getting more and more adventurous as I get older and we’ve come away from the trip with a great feeling of accomplishment. Whenever I book a holiday I always read up online and in books about the destination itself, vaccines and other things to keep in mind and this leaves all the worrying aside so you can really enjoy yourself once you’re there, knowing you’ve come prepared. This was so helpful for alleviating altitude-related problems. We drank 2-3 cups a day. It is available in the hotels and in cafes and it is really popular with the locals. We handled the altitude fine and think that the tea helped us with this. Again, altitude can be a problem in Peru but if you listen to your body and rest when you need to you’ll be fine. Just take it slow and steady!